Manufactured in the heart of Russia, Silver Bear ammunition is just as rugged and reliable as the country it comes from. 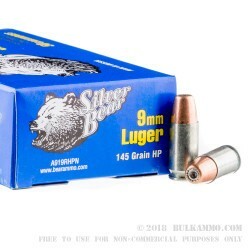 The SIlver Bear 145 grain 9mm Hollow Point is a high performance defense round at an economic price, and a buying opportunity that you do not want to miss out on. 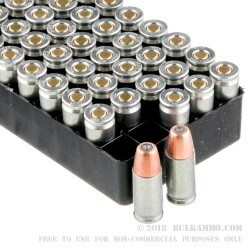 While brass cartridges afford greater reloading opportunity, self defense rounds are rarely reload due to legal considerations when using lethal force; and are one of the number one expenses when producing ammunition. 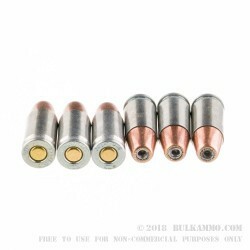 The SIlver Bear 145gr 9mm Hollow Point only utilizes steel cartridges that achieve identical chamber pressures as their brass counterparts, and at less than half the cost to manufacture. A cost savings that is passed directly onto you, the shooter. Non-corrosive boxer style primers provide for a consistent and reliable reload, and at a price you can afford to shoot competitively, one of the most in demand ammunition on the range today. 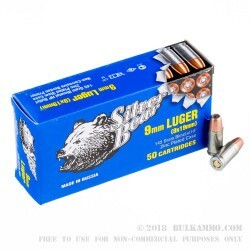 Shooters looking for a reliable self defense ammunition at a surplus price, will find a great value in the SIlver Bear 145gr 9mm Hollow Point ammunition.